An airpot, otherwise known as a push pot, coffee pot, or coffee server is a great serving vessel for cafes and catering events. However, not much information is out there about what exactly an airpot can do. We created a list of the most frequently asked questions about airpots. Q: What is an airpot? An airpot is an insulated serving vessel that holds hot beverages, most commonly either coffee or hot water. An individual can easily dispense the beverage by using a pump or lever lid. An airpot will either have a glass-liner, which will have a temperature retention of 6–8 hours, or a stainless-liner, which will have a temperature retention of 4–6 hours. See Identifying the Parts of an Airpot for a full look at all the parts within an airpot. Q: How big is an airpot? Depending on where you buy an airpot, this answer can vary. However, there are five main sizes of airpots that will hold either 1.9-, 2.2-, 2.5-, 3-, or 3.7-liters. Airpots dimensions also vary, depending on the size of brewer you have. Q: How does an airpot work? With a simple press of the lever lid on an airpot, the bellows inside the lid of the airpot are activated, pushing air into the chamber and increasing the pressure inside. The increase in pressure forces coffee into the suction pipe and out the spout, filling your empty cup. Read more about the full functionality of an airpot here. Q: How do you brew coffee into an airpot? Brewing coffee into an airpot involves very little equipment. The equipment you do need is a brewer, airpot, and coffee filter. First, fill the coffee filter with ground coffee. Then, place the filled filter in the brew basket, which fits perfectly into the brewer. Place the airpot underneath the brewer, and push the "brew" button. Read more in detail about this here. Q: How do you clean an airpot? 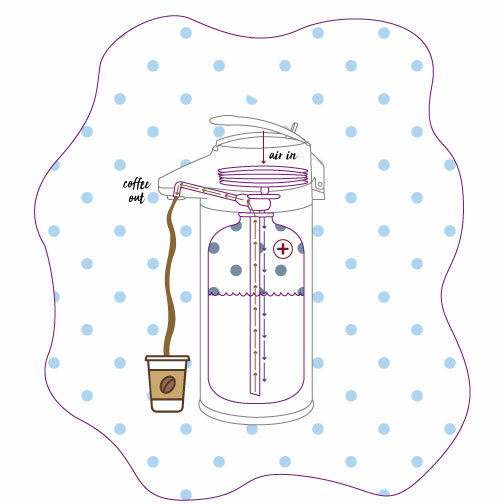 Similar to brewing coffee, an airpot is generally cleaned by using a cleaning solution, placing it in the brew basket, and running hot water through the brewer to the airpot. Never use a brush to clean out the inside of an airpot, as this can cause the liner to get scratched or break. Learn more about daily and weekly cleaning of an airpot here. Q: Which establishments use airpots? Airpots can be used by many establishments. It is most common to see them at coffee shops, diners, hotels, convention centers, catering events, gas stations, etc. 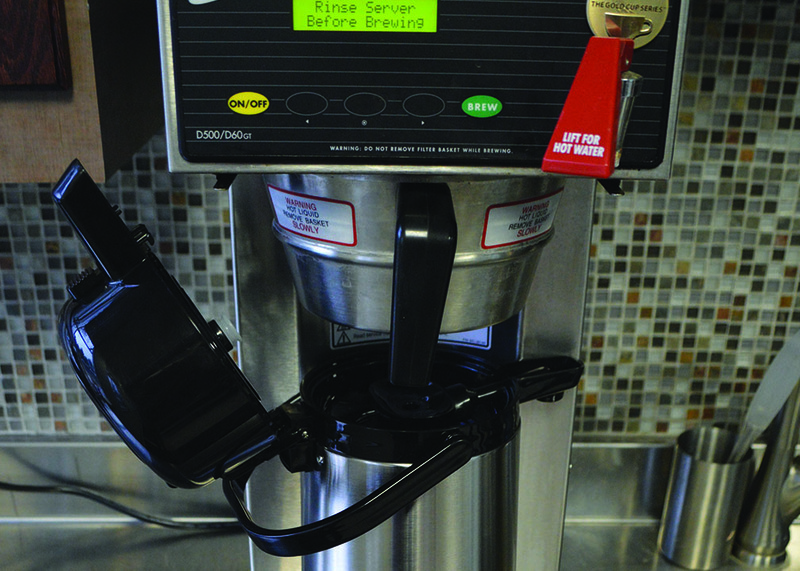 Many times, establishments use multiple airpots so they can offer their guests a variety of coffee roasts, including regular, decaf, and flavored. Q: Are airpots meant more for self-service or behind-the-counter? Airpots work great for both self-service or behind-the-counter. If you are in a constant rush, providing your guests with the option to help themselves to coffee from an airpot, creates less work for you. However, if you want to give your guests a more enhanced experience, keeping the airpots behind the counter allows you to serve them directly. Read Self-Serve or Behind-the-Counter? 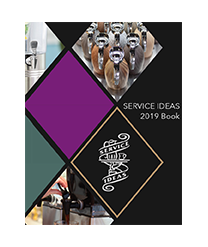 Types of Coffee Service and the Different Ways They Serve it Up to learn more. Q: Which airpot is best for me? To determine which airpot is best for you, ask yourself two main questions: Do you want a stainless or glass lined airpot? 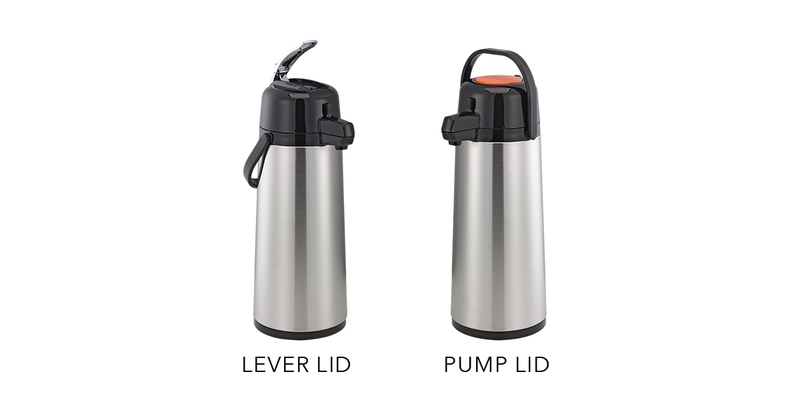 and, Do you want a pump or lever lid? These two questions will simplify your selection and help you choose an airpot great for your establishment. See our full line of airpots here. 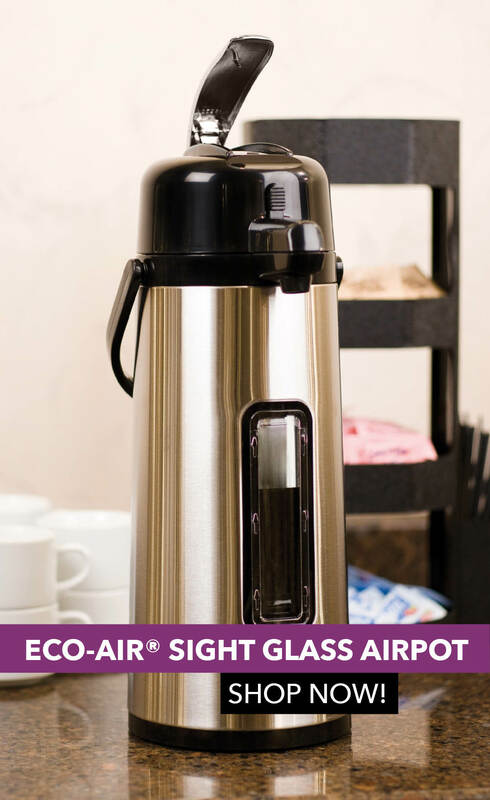 Airpots are great for keeping your coffee fresh for extended periods of time, serving a large volume of people, and offering multiple flavors or roasts of coffee at an event. They are one of the most common serving vessels used in commercial and office coffee service. Although they may seem complicated, they are relatively easy-to-use and brew into. 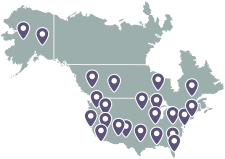 Please contact us if you have anymore questions about airpots; we would love to help you out.